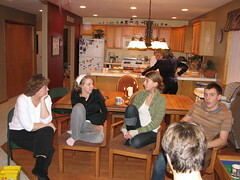 On Sunday evening, the Bulthuis family got together at Aaron and Jen's house. This was after a candlelight service at Bethel Church. It was great to see Karen who came from New York, and Rebekah who came from Michigan. We presented Mom with a digital photo display loaded with family pictures from us all. We hope that the continual visual exposure to her children, grandchildren and great-grand children will keep her memory of us sharper. We will spend a somewhat quiet Christmas Eve. with just the four of us. Breaking News! Regarding our linguistic conversation on the legitimacy of the word "may'nt": Is it or is it not a word? According to the Oxford English Dictionary ("THE definitive dictionary of the English Language" according to Brian) IT IS A WORD! It's not commonly used, particularly in American English, but it is an acceptable contraction for "may not". Anyway, we just thought we should send on the research, for everyone's amusement! The Bulthuis clan had it right! Even if we sound like a Dicken's novel. To Bjorn, Calvin, Esther, Peter, Jenny + Markus: Great to see all of you Sunday night! Lots of love from all of us Lynden-side.